Hey guys, it’s Leigh Ann from My Diary of Us! The holidays are here y’all and I couldn’t be more excited about it! From Christmas movies, to decorations, and spending time with family and friends…it really is the most wonderful time of the year! One of my favorite ways to celebrate the holidays is by having those who I love the most gather together and share a delicious meal! Food brings people together in such a special way and that’s why I have created a delicious meal that can be enjoyed at any holiday gathering! My pomegranate rosemary braised short ribs are cozy, full of flavor, and perfect for any holiday feast! Short ribs are best when cooked long and slow to where the meat will pull of the bone with ease. 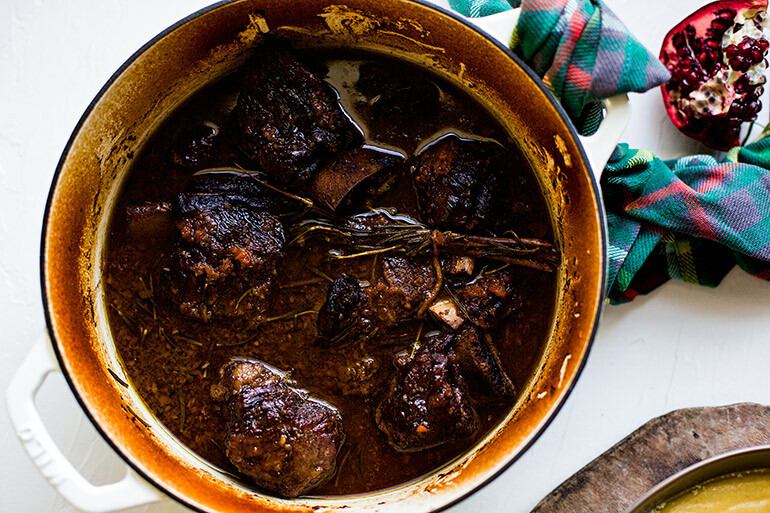 These short ribs are simmered in a rosemary pomegranate broth that will wow your tastebuds no doubt! 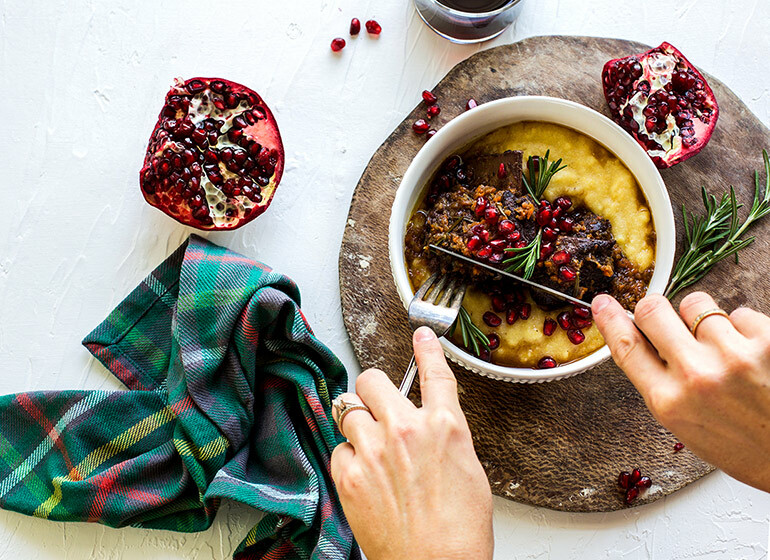 The pomegranate juice adds just a touch of sweetness to this savory dish and makes it extra festive for any gathering you might be hosting this year! In my family we always have beef on Christmas Eve, and these short ribs are going to be my new favorite recipe to make! When you find a recipe that is so good that you want to make it year after year, you know it’s a winner! So here is the good news…while short ribs might seem intimidating to some, they are actually quite simple if you have a little time to let them do their thing! The result is tender beef on top of a bed of creamy polenta, topped with crunchy pomegranate seeds and it truly makes for a show stopping presentation that is utterly delicious too! I can’t wait for you to try this recipe out! These short ribs are so beautiful, full of flavor and they are the ultimate cozy dish for the holidays! Salt and pepper both sides of the short ribs liberally and let sit at room temperature for 30 minutes. Pulse carrots, celery, and garlic in a food processor until it forms a paste like consistency. Add oil to a large oven safe dutch oven and heat over medium high heat. When the pan is hot add short ribs, in two batches so that you don’t overcrowd the pan, and sear on both sides for 3-4 minutes until a nice crust forms. Add pulsed veggies to the hot pan and scrape up any bits in the bottom of the pan left from searing the short ribs and season again with salt and pepper. Sauté veggies until they get tender, about 3 minutes. Deglaze the pan by adding pomegranate juice and wine to the veggies and stirring to scrape up all of the brown bits on bottom of pan. Add in rosemary at this time and let the sauce cook for another couple of minutes. Add in short ribs to the liquid and then place the lid on top of the dutch oven and place into the oven to cook for about 3 hours until meat is tender. Remove the lid for the last 20 minutes of cook time to reduce and thicken the sauce. When the short ribs are almost done make the polenta by bringing water or stock to a boil, salt the water liberally, and then whisk in corn meal to ensure it doesn’t clump up on you. Reduce the heat and stir the polenta every couple of minutes until the polenta has thickened. This will take about five minutes. Add butter to the polenta along with a good amount of salt and pepper according to taste. 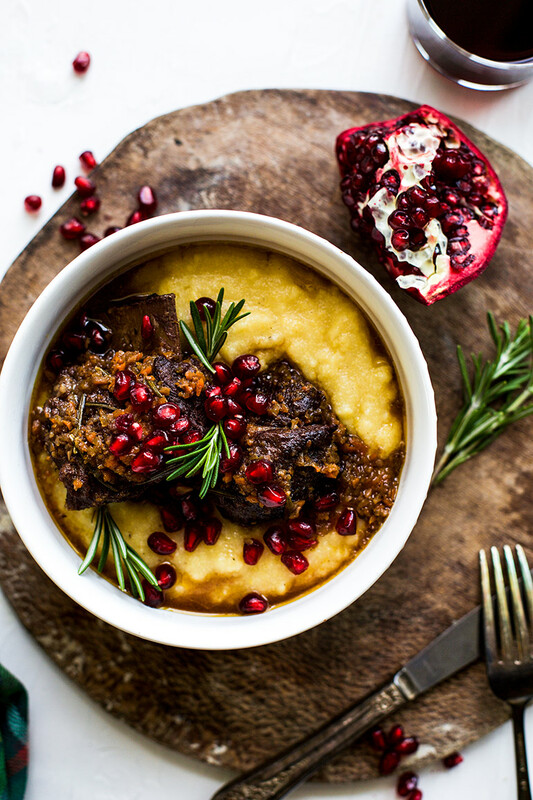 Serve short ribs over the polenta and pour a little extra sauce over top along with a good sprinkling of fresh pomegranate arils.